Audrey Hendrickson doesn't dislike dogs. What she dislikes are dog owners who insist on taking their pooches with them everywhere they go — to restaurants, movie theaters, clothing shops and grocery stores. "At a brew pub, the owner is paying attention to their beer and their friend, and their dog may be doing something else entirely," she said. "There are issues with hygiene, with people having phobias, or having allergies and someone who just brings their dog everywhere is only thinking about themselves and their dog and not thinking other people and how they are going to interact with that dog." 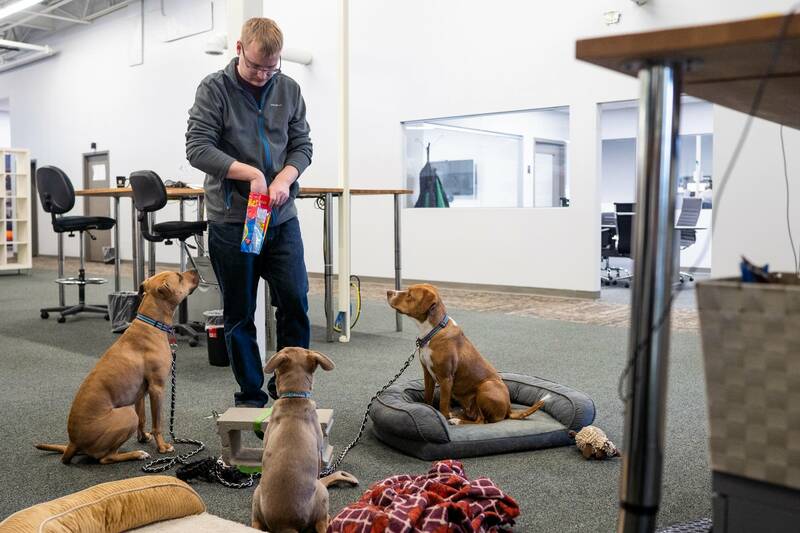 It's a behavioral shift Hendrickson and others see increasingly as more Twin Cities stores and workplaces adopt dog-friendly policies, letting canines go where their owners go. Changing attitudes about pet ownership and work-life balance are redrawing social boundaries. Dogs, especially, are viewed by many owners as constant companions, not to be left home. Retailers and firms that have gone dog-friendly say it's helped recruit workers and lure new customers. They also acknowledge it's opened the door to some messy situations, like when owners don't clean up after their pets or try to pass off their dogs as trained service animals so that they can bring them anywhere. There's no doubt, though, the trend is here to stay. A 2015 survey by the Harris Poll found that 95 percent of owners consider their pets to be members of the family, up 7 points since the question was first asked in 2007. Just a few years ago, OxfordDictionaries.com added "fur baby" to its directory. 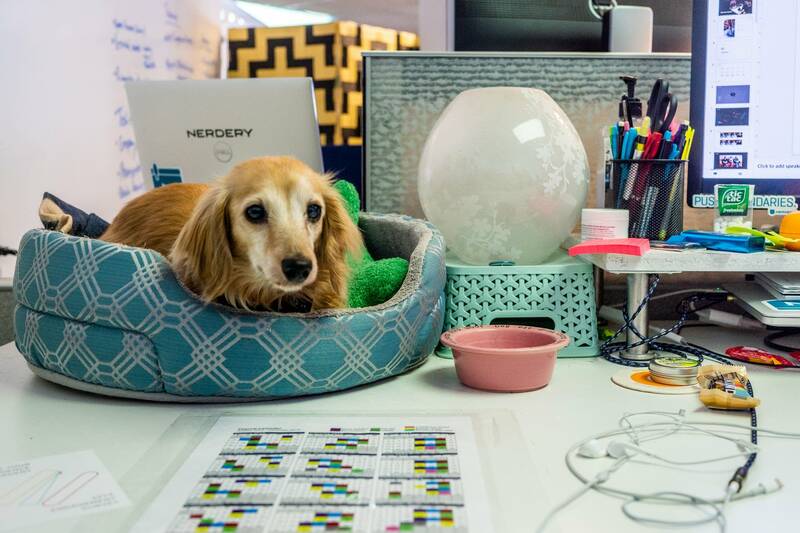 Meanwhile, a 2018 Society for Human Resource Management benefit survey found that 9 percent of employers allow pets at work, up from 4 percent in 2014. Ali Jarvis, CEO of Sidewalk Dog, a local guide to all things dog-friendly, said that when she founded her Twin Cities company 11 years ago, only a handful of businesses would welcome her pups. Today, thousands of businesses are listed in Sidewalk Dog's directories, which recently expanded to include Chicago, Seattle and Denver. "Where we used to have to dig and dig to find businesses to add to the directory, now we get calls weekly," Jarvis said. Taprooms have become some of the most popular destinations for people and their pets. Bauhaus Brew Labs in northeast Minneapolis is no different. They've even hosted dog-centric events in the taproom. "Our whole philosophy is built on inclusivity," said marketing director Maura Hagerty Schwandt. "We want to make sure that everybody is feeling welcomed and feels like they have a place to hang out." She said that in the nearly five years they've been open, they've only received one or two negative complaints about dogs in the taproom. Bauhaus Brew Labs' positive experience isn't universal. Some Twin Cities businesses have been forced to pull back the reins on pets, mostly because of their owners' behavior. At Rosedale Center in Roseville, neglectful owners led mall officials to pull the plug on its popular Sunday dog-walking program. 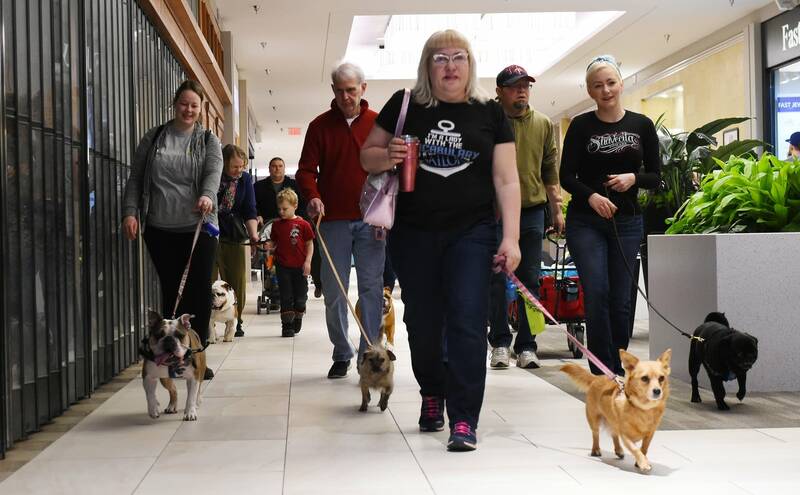 In early 2018, the mall began welcoming dogs and their owners for indoor walking before the shopping center opened for business. 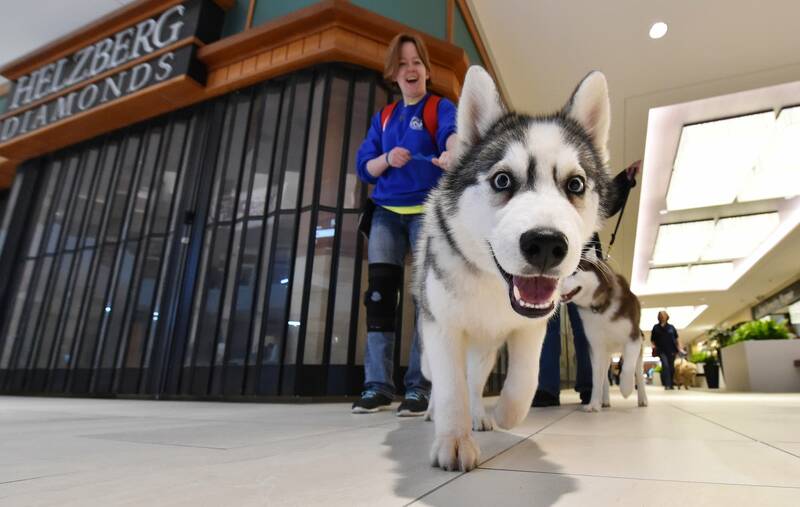 For two hours, pups and their people could do 1.1-mile laps around the upper and lower levels of the shopping center protected from the unpleasant weather outside. Some stores even got in on the action, setting out water and dog treats. It was originally intended to last just through spring but became so popular that the mall extended dog walking through the rest of the year. About 100 people showed up during the first indoor dog-walking session; at its peak, crowds numbered in the several hundreds. After a hiatus during the busy holiday shopping season, indoor dog walking returned in January, just in time for the polar vortex and the snowiest February on record. It was welcome relief for many because the dangerous temperatures and snow-covered sidewalks forced many dogs and their owners to stay indoors. But by the end of February, dog walking at the mall was over. Some owners weren't cleaning up after their animals, forcing maintenance staff to do the dirty work. Staff struggled to get the mall ready in time for regular shopping hours. "It got to the point where having all these dogs inside of our center, we had a lot of accidents ... and it just started to get too much, we just could not keep up with the demand," said Lisa Crain, Rosedale's general manager. Hendrickson, the St. Paul resident, said she wasn't surprised to hear the program had to be canceled. She had answered a reporter's Twitter query about dogs in workplaces and businesses, and in an interview, said she's confronted a number of dog owners about their practices. She used to live on the West Coast, where attitudes are more lenient about dogs in public spaces. Those conversations usually go nowhere, she said. "Those people think, 'What's the problem?' and that I'm being mean," Hendrickson said. The question of what is or isn't a service dog has also become an issue in recent years, thanks in part to the rise of online shopping. By federal law, businesses that serve the public generally must allow people with disabilities to enter with their service animal and go with them wherever customers are normally allowed to go. Service animals are defined as dogs that are trained to do work or perform tasks for people with disabilities that are directly related to the person's disability. Emotional support or comfort dogs do not qualify as service animals and don't have the same broad legal protections. But increasingly, people are trying to pass off their non-service dogs as service animals. 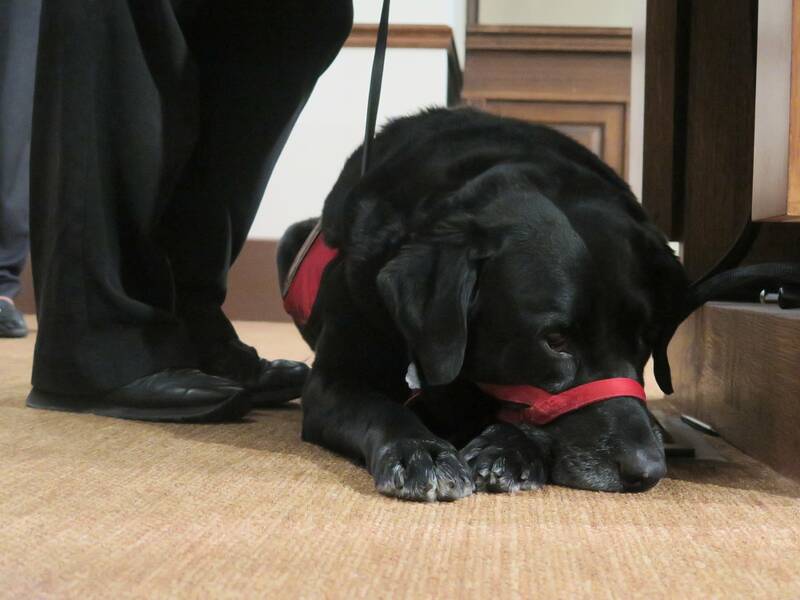 In March 2018, advocates told Minnesota House members that online shopping has made it too easy to buy service animal vests online, and that instances were growing of people putting them on untrained animals and taking them to public spaces. A number of states — including Minnesota — have cracked down. Last year, then-Gov. Mark Dayton signed into law legislation that prohibits people from misrepresenting their dog as a service animal. Despite having a messy problem with cleanup at Rosedale Center, Crain said being dog-friendly on Sunday mornings was good for business. Even though stores weren't yet open, she believes people "came back to look at what they saw in the window." Jarvis, the Sidewalk Dog CEO, said she's heard the same thing from other stores and boutiques. "One gift store was seeing people walking their dogs and not coming in because she wasn't dog-friendly," she said. "Once she decided to be dog-friendly ... they ended up staying and buying things, they ended up being really loyal to the business." 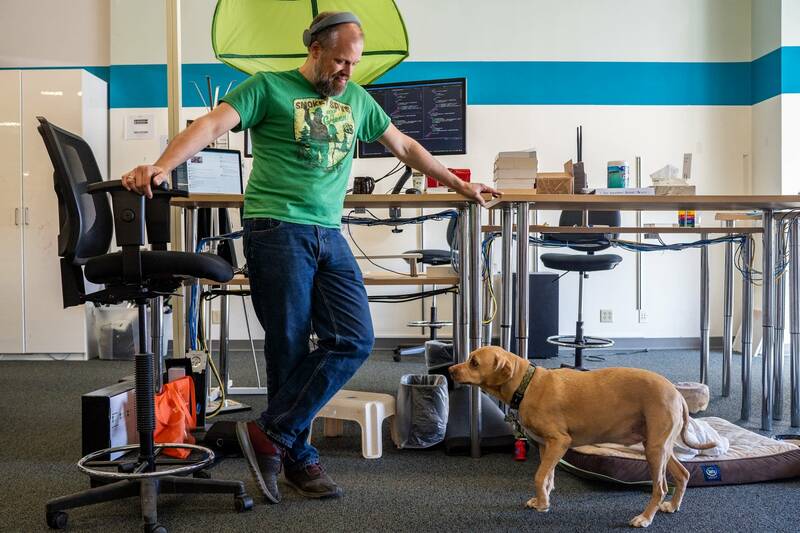 At workplaces, businesses have found that allowing dogs can mean happier employees. Josh Ellingson has worked at the Nerdery, a digital business consultancy in Bloomington, for five years. 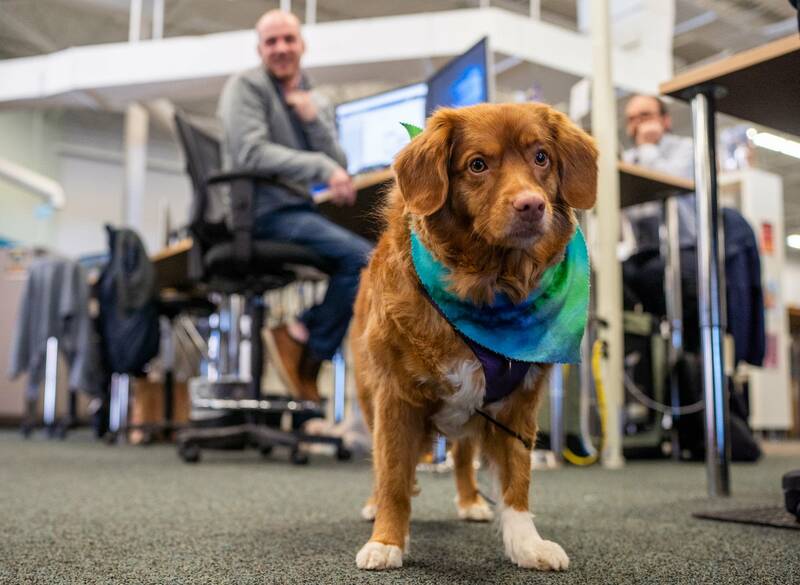 And pretty much every day for the last five years, his Nova Scotia duck tolling retriever, Penny, has accompanied him to the office. "It kinda helps me during my day to feel less stressed out," he said, noting that Penny seems to do the same job for his colleagues as well. "People come by and say hi to her all the time, and that seems to be a stress-reliever for them." 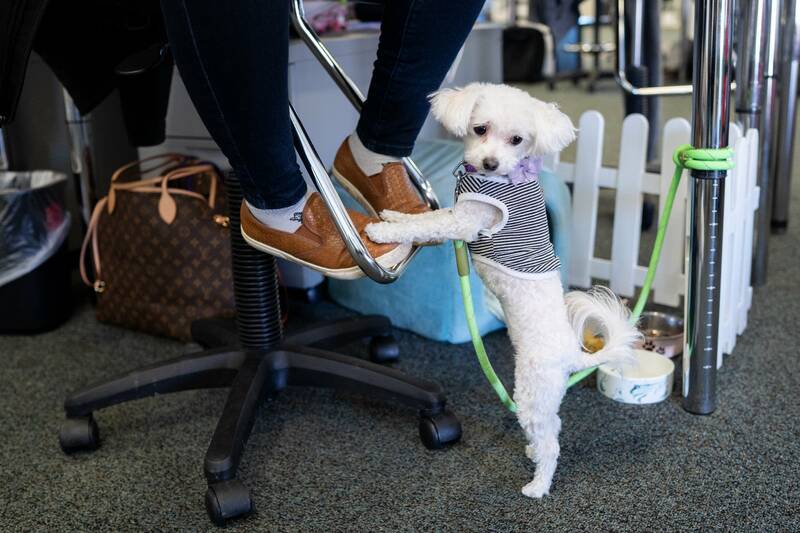 Various studies have found that dogs in the workplace help provide social support for employees, as well as improve social interactions between co-workers. Not everyone wants to be or can be around dogs, but the Nerdery says it's careful to accommodate those with allergies or phobias. 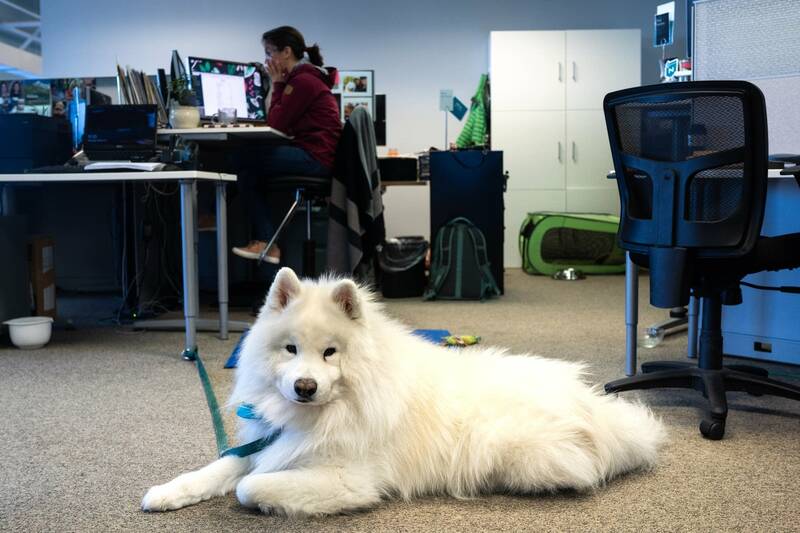 They're upfront during the interviewing process that the 76,000-square-foot office welcomes dogs, and can make adjustments on where people sit. Employees are asked to keep their dogs leashed and supervised at all times. In the last four or five years, only one dog has been "suspended." "The general feeling and general view is that in this place, this company cares about its people and cares about their families," said Chris Rush, the company's facilities management director. "The dogs are just an extension of their families." It also helps that the Nerdery cleans the carpet every two weeks. On any given day, there can be five to 25 pups at the office. But walking into the offices, there's nary a canine scent. Said Rush: "It doesn't smell like dog, which is a big deal to me."